Cameroon president Paul Biya says he is ready for dialogue with separatist elements to end the ongoing security crisis in the country’s English speaking regions. 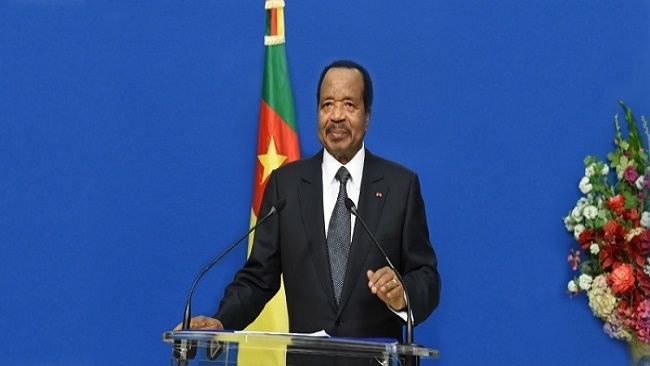 Biya in his New Year address to the nation said he was ready to engage with persons with goodwill to end the crisis that has been going on since October 2017. “If my appeal to war mongers remain unheeded to, the defence and security forces will be instructed to neutralize them. I am aware of the situation and difficulties the rebels are putting the people in. “It will not continue,” Biya said. In other planks of security, the octogenarian stated that the security situation in the Far North where Boko Haram attacks are recorded had been stabilized. It is the first time that Biya is speaking directly to the subject of dialogue. International partners and the church had long advocated this position as the only way out of the crisis. There are no concrete clarifications on who exactly are the goodwill personalities Yaounde is willing to engage. Separatist leaders are currently facing treason and terrorism charges before a military tribunal. The situation in the North West and South West regions worries me most…but I can assure You, it will not last for long. President Paul Biya says he is aware of the difficulties of the population of the troubled North West and South West regions of Cameroon. He has promised to hasten the decentralisation process and also enforce the activities of the bilingualism commission. In the past, Biya’s Interior Minister, Paul Atanga Nji, has stressed that government was never going to enter any kind of dialogue with terrorists. The crisis concentrated in the northwest and southwest regions have claimed scores of lives on the part of separatists and security forces. Civilians have also been killed in the line of fire. Thousands of Cameroonians have fled the regions, some have crossed into the French side of the country whiles others fled into Nigeria.